In various ads destinations we often find the slogan of “missing Heaven.” How much do you trust to the truth of those ads with actual reality? Nevertheless, if you visit the waterfall Jumog you will find that the slogan is approaching the truth. When we hear the term missing heaven tours, what we mean in mind is satisfaction of our five senses in that location. Our eyes are very satisfied to see glamour panorama, our ears feel comfortable hearing the sound of splattering water, birds, wind, melodic soft sigh was blowing trees and far from noise from a life in other places full of pollution. Meanwhile our noses smell typical of the variety fragrance of trees and particular flowers aroma that thrives in that location. The senses of taste the skin we also feel the favor by the coolness of air that sometimes feels to penetrate to the bone. Not to miss, the tongue also could sway the tasting menu of various local food sold. If the description above express about a missing Heaven then it is no exaggeration if such a slogan attached to attractions of Jumog Waterfalls. Yes, it is not wrong that Jumog is indeed a Heaven that is missing. We rarely find such an atmosphere especially one who has always lived in urban areas that often filled with pollution and rarely have time to travel out of town. However, if you visit Jumog the missing “Heaven” was undoubtedly you could find again. Jumog name is taken from the name of the hill where the waterfall is located. Jumog is in a region with another tourist attraction of Sukuh Temple, which is only about 1.5 KM on the western slope of Mount Lawu, Karanganyar Regency, and Central Java Province. The complex tours began in operation in 2007. Previously, the waterfall —its height about 12 meters— is difficult to achieve. Once people can only see it from a distance of about 200 meters due to the point where the fall of water in the form of a very steep rocky cliffs and slick as well as filled with hordes of bamboo trees and sengon. The waterfall splits two hills that surround it. Left Hill is planted pine trees while the right one is transformed into fields by local people to grow vegetables such as carrots, cabbage, chili, beans and vegetable crops. The Left Hill is relatively easier to reach because being in the side of the road connecting the Berjo village and Gondang village. Now you can imagine how the atmosphere of a place of tourism before it opened almost never being touched by human. After being in this place then your five senses will be pampered by a still natural, far from noise and pollution. Thus when in complex of Jumog waterfall You can feel as if carried away to a place of some twenty years ago in which everything is still all in beautiful and peaceful. Then do not be surprised when you visit there you will see many tourists who enjoy and linger in this tourist complex even though the facilities available were simple and limited. Many groups of young people and families spend time from morning to evening. Indeed, for this tourist spot is only operated from 8 a.m. 5 p.m. Although tourist facilities are still simple and limited but they sufficient to meet your various personal needs. In addition to the waterfalls which became the main icon, in the complex is also available a medium-size swimming pool, play ground for children, some open Halls for the rest, some toilets and bathroom as well as a stage entertainment that featured live music performances (often dangdut) on weekends and during the holiday season. If Halls are full, on the right and left sides of river throughout the complex also available many relax places in the land of fields where You can roll out the mat as its base. If you do not have the mat, you can rent it. To spoil your tongue, in the complex there are traders of various food and drink. You can get a shop selling various menus like chicken satay, goat satay chicken noodles, meatballs and fried rice. The favorite food at Jumog is rabbits satay. You do not need to worry about the cost, the price food and drinks in the Jumog are still reasonable. After arriving at the site, of course first of all you have to do is getting off into the point of waterfall. You will feel the thrill of the chill of air combined with the chill of water. If the air is bright, look at the top at water spray, undoubtedly you will be astonished to observe the water’s mist that look like Rainbow. Once satisfied or cannot hold by cold because being wet, then you move to Halls to change clothes and enjoy the food. There are some options of road to reach the venue. It is all good, depending on the type of vehicle you use is a motorcycle or car. Also depending on whether you just visit Jumog or also at the same time visiting other tourist destinations. If you also planned visits to other places then you are recommended to take a different route so your travel would be more efficiently. All route options assumed you shove off from the city of Solo, which is about 40 KM and takes far less than an hour. The first assumptions if beside Jumog You also intend to travel to Tawang Mangu then your route is: Solo-Palur-Karanganyar – Karang Pandan and in intersection of Keprabon you take the right leads to Tawang Mangu. In a bend named Karangtaji you turn left then you will pass through several villages such as Srandon – Taji – Jamanganti, Duren – Semprong – Pringapus – Bangkang – Semprong – Tagung – Berjo then you’ve got Jumog. After the completion of the Jumog visit, you back through the original route and arriving at Karangtaji again and you turn left towards Tawang Mangu. So if you have a goal Jumog and Tawang Mangu then you are advised to give precedence to Jumog. Second, if before Jumog you intend to visit Candi Sukuh then your route should be: Solo – Palur – Karanganyar – Karang Pandan and in intersection Keprabon you take the left leads to Sukuh. 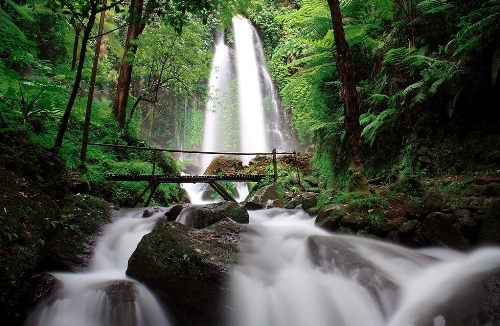 After visiting Sukuh Temple you continue to Jumog waterfall through the villages of Selorejo, Pabongan, Berjo and You’ve arrived at Jumog. Passing whatever routes, you do not have to worry about getting lost because since the distance of few kilometers before the location you will find many Board instructions, which will guide you to the location. Both the choice of the route above assumed you use four-wheeled mode of transportation or car. If you are using a two-wheel vehicles or motorcycles, then after approaching the location of there are some options available to pass through the small streets that could only be reached by motorcycle. For example, of the Candi Sukuh to go to Jumog You can pass through the village of Gondang. From there you can enter the complex Jumog of the East side, because Jumog is in the Southwest of Gondang village. Nama Karanganyar di Jawa Tengah memang. Dinas Pekerjaan Umum (DPU) Karanganyar memastikan. Pembangunan Waduk Gondang di Desa Ganten,. Bagi yang gemar wisata alam, Air.